What is the intensity of loneliness? How often does someone feel lonely for? How long does someone feel lonely for? Part of dealing with loneliness means looking at what causes people to be physically and/or psychologically disconnected. In coming up with solutions to loneliness, we also need to think about how we preserve an individual’s autonomy and privacy. The Minster for Loneliness, Tracey Crouch MP spoke about the government’s first loneliness strategy. The government’s focus is to create strong, connected communities. The strategy wants to help individuals to forge meaningful and long lasting social connections. It’s the first of the kind in the world, cutting across 9 government departments. Crouch emphasised how every solution to loneliness is different. We need joined up thinking between government, civil society, and the Third Sector to come up with a range of personalised, effective solutions. We also heard from CEO Richard Kramer about Sense’s recent Buddying Programme. This programme buddies disabled young people with their non-disabled peers. Young people develop friendships through shared hobbies and experiences. 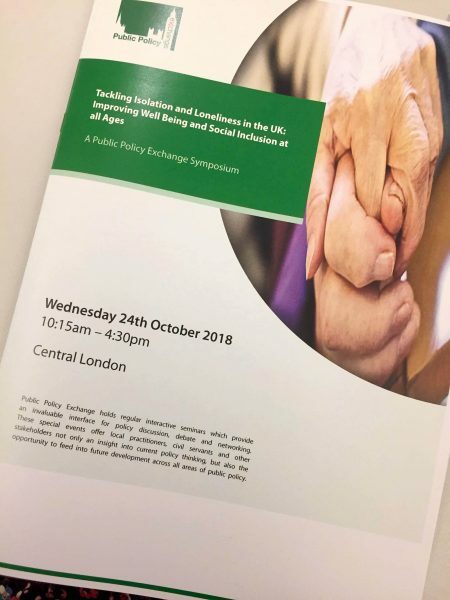 Annabel Collins also talked about the Ageing Better in Camden project which identifies and supports socially isolated people in the local community. The project links people with Community Connectors, who then lead individuals to local support and activities going on in the area. What was striking about this programme was the Older People’s Advisory Group, who are fundamental to the direction fo the programme – and are consulted at every step. There was discussion about how we link up work going on in a local area. How do we get beyond a silo way of working? How do we encourage better collaborations between the individual, community, and service sectors? One of the biggest take aways was how we all need to open up the conversation to remove the stigma around loneliness. Not everyone is equally vulnerable to loneliness, so we need to think about who is most at risk and where the most effective solutions can be. Technology was largely absent from the conversations. There were questions raised about the use of social media and whether technology can play a part in the solution. There was a general feeling of ambivalence about the role technology plays. WaveLength has seen for the last 80 years the positive effects which technology has on the people we help. However, clearly a bigger conversation is needed to share best practice, as well as the challenges which technology presents. Overall, thank you to Public Policy Exchange, the presenters, and delegates for a fascinating and productive day.